Easily block spam, phishing and malware, and prevent data leaks and compliance violations. Email is crucial for your business communication, but it can also expose your business to sabotage and productivity drains if email-based threats, such as spam, phishing, spoofing, viruses and zombies flood your mail servers and user inboxes. With innovative protection techniques for both inbound and outbound email plus unique management tools, Big Iron delivers superior email protection today — while standing ready to stop the new attacks of tomorrow. Big Iron, employs a multi-level approach, providing superior email protection at many levels throughout the email chain. Our email security solutions can be deployed through a hosting solution, as a virtual appliance leveraging shared computing resources, or software, with further levels of security installed on your internal mail server and individual devices. Block spam, phishing, zombie and virus attacks with over 99% effectiveness and ensure delivery of good email using an array of proven and patented techniques. Add a powerful framework for stopping data leaks, managing and enforcing compliance requirements and providing mobile-ready secure email exchange for businesses of all sizes. Customise rules to detect and block specific types of attachments, reroute email from competitors and check outbound email for specific words and phrases. Centralised reporting gives you easily customisable, system-wide and granular information on attack types, solution effectiveness and built-in performance monitoring. Choose how much control to delegate to end users, by deploying or deleting junk email boxes, providing access to spam blocking settings and more. Easy to set up and administer, email security can be deployed as a hardware appliance, as a virtual appliance leveraging shared computing resources, or as software. Stamp out phishing, zombie and virus attacks and put an end to compliance violations with our custom Hosted Email Security options. Experience multi-layer, anti-virus threat protection, including SonicWALL Global Response Intelligent Defense (GRID)™, McAfee®, Kaspersky™, Cyren and SonicWALL Time-Zero virus protection, that is more effective than services that rely on a single anti-virus technology. Prevent confidential data leaks and regulatory violations with advanced compliance scanning and management. Add optional email encryption service to ensure the secure exchange of email containing sensitive customer data or confidential information. Trust fast-to-deploy and easy-to-administer hosted services to protect you from inbound and outbound email threats. Get predictable, cost-effective monthly or annual subscription rates with no upfront costs. Deploy the robust protection of a SonicWALL Email Security appliance in a virtual form to ease migration, optimise utilisation and reduce capital costs. Receive total inbound and outbound email protection in a highly scalable VMware environment. 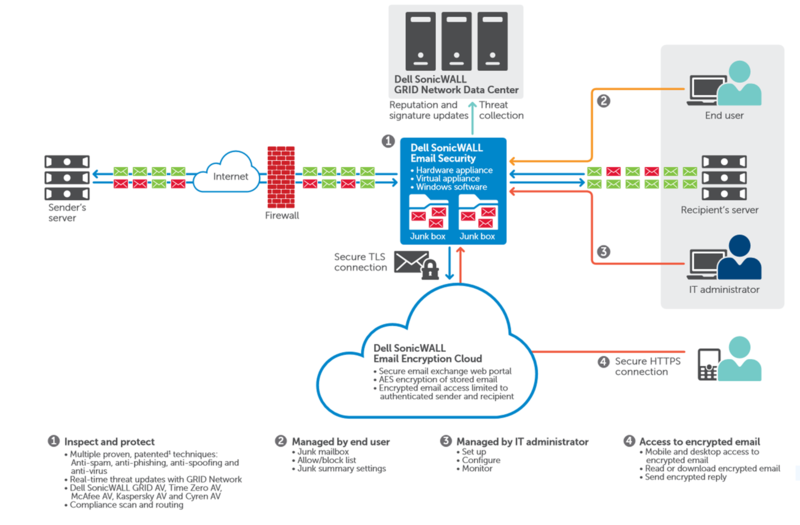 Experience the same powerful security as a traditional Dell SonicWALL Email Security Appliance, only in a virtual form. Safeguard your email with advanced protection against malware and spam. ESET Mail Security for Microsoft Exchange Server integrates powerful anti-virus and anti-spam detection capabilities that ensure all harmful email-borne content is filtered away at the server level, while ESET’s light footprint means your system can continue to run at full speed. With our solution, you get complete server protection – including the server’s own file system. You can apply policies for specific content based on real file type, and monitor security status or fine-tune configuration easily via our user-friendly ESET Remote Administrator tool. Anti-virus & Anti-spam eliminates all types of threats, including viruses, rootkits, worms and spyware and stops spam and phishing attempts with high interception rates. 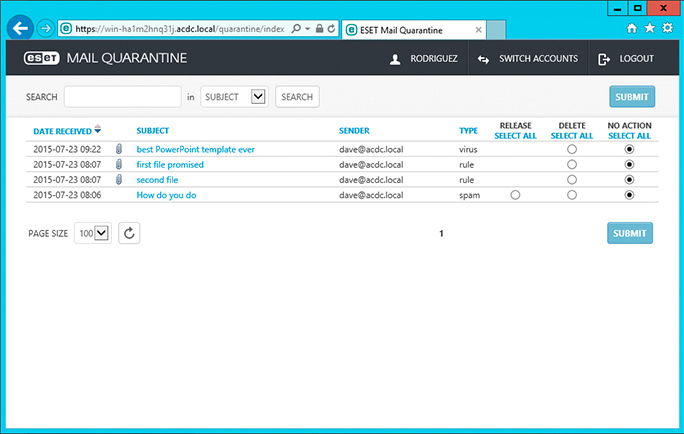 Local Quarantine of spam and undelivered messages accessible and manageable by mailbox owner via a standalone browser. Meets the needs of complex network infrastructure. Optimised for virtual environments, with snapshot independence and native clustering support.